Cuc Phuong National Park, located 120km south of Hanoi in Ninh Binh province, as the first national park in Vietnam and also the country’s largest nature reserve. 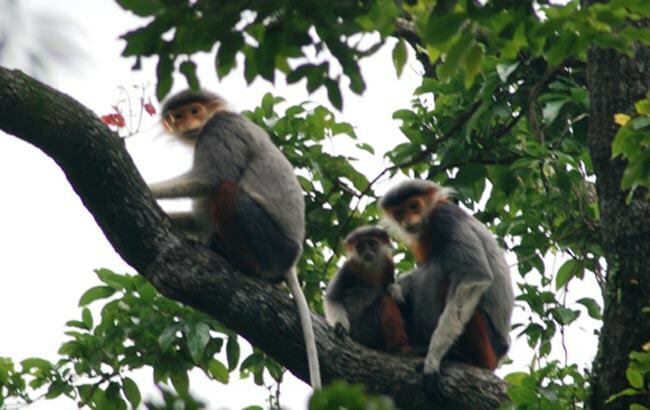 The great time to travel to Cuc Phuong is in dry season, from November to April when the heavy forest rain is over. 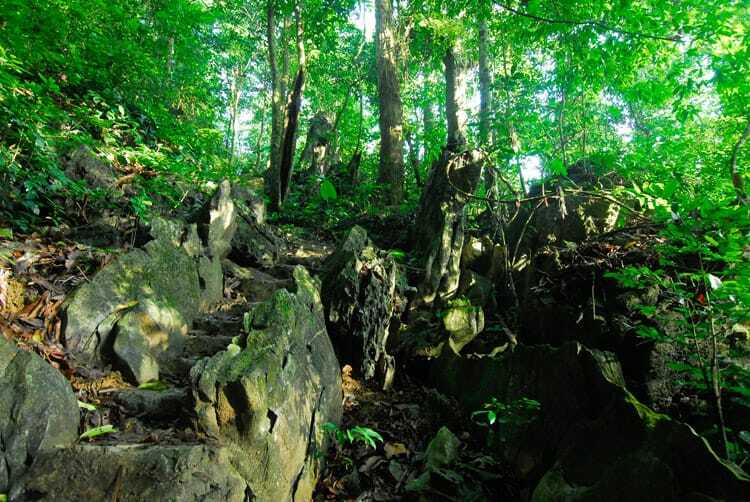 Let’s go and discover Cuc Phuong jungle the whole exceptional world inside this primary forest and visit the most prominent attractions below. 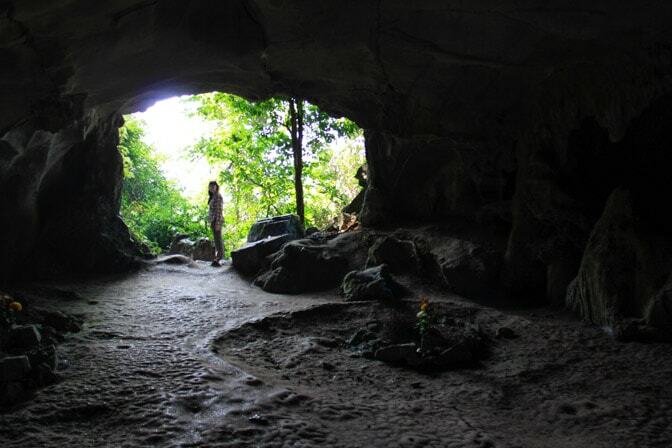 Cave of Prehistoric man is the residential relic of the prehistoric man – a precious heritage of Cuc Phuong National Park. It will take you about 300 meters to walk from the main road then climb up about fifty steps against the slope stone stairs to reach the mouth of the cave. The Dang ancient tree is located about 2 km away from the Cave of Prehistoric man. You will hardly to see the top of the tree because its height is up to 45 meter, while its diameter is 5 meter that may be only 8 people can hug the tree body. Let’s stand below the shadow of the Dang ancient tree to experience the feeling of being so mall. This thousand-year tree is also very tall (around 45 meters) but its diameter is fourth times compared to the diameter of Dang ancient tree. It need at least 20 adults with their arm length full to embrace completely the whole tree trunk. Trekking distance about 3 km to meet this special wonder of the Mother Nature here. Besides, near the Thousand-year tree location, there is small track leading to Son Cung Cave that owning many very beautiful stalactites. It is highly recommended to visit these points for those like advantageous trekking. 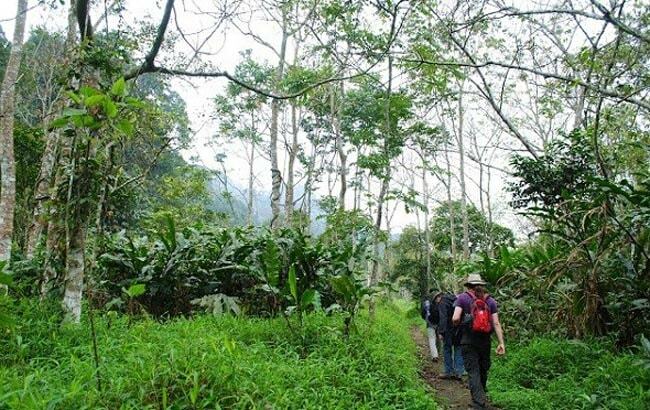 You will trek through the forest and stay overnight at home stay with local villagers. Start from the center of the Park toward the western part of the forest, and then reach the Sau ancient tree after 3km of walking. 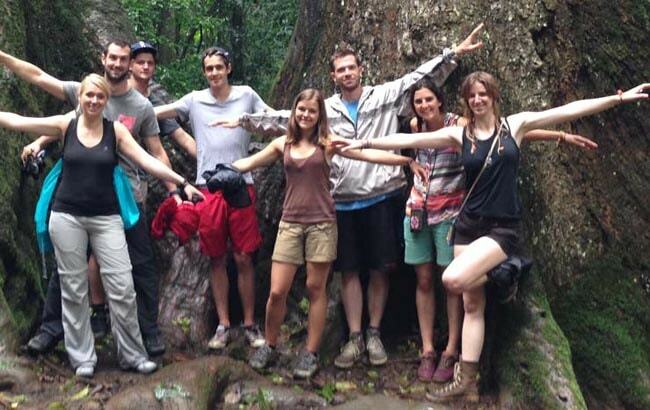 This tree can be considered as the landmark for your next advantageous trekking ahead. Let’s relax under its giant leaf canopy to have more courage and energy to walk more 13 km on small track across the jungle, leading to Muong village. This Muong village will you’re your eyes on its special traditional cultural characters, low house on stilts with roof made from palm leaves or alang grass, looms and beautiful Muong girls weaving motley brocade cloths. Standing on the May Bac peak at the height of 648 meters, you can see the whole of Cuc Phuong landscape, even see the Hoa Lu ancient citadel and Bai Dinh pagoda, the comprehensive view of Trang An, too. Thanks to the climate always being cool at 23 degree Celsius with the annual average rainfall of 1800mm, is so much helpful for your trekking rout of 6 km. With about 4 hours of trekking, and if you have no problem with cardiac, this trekking route would be very interesting. 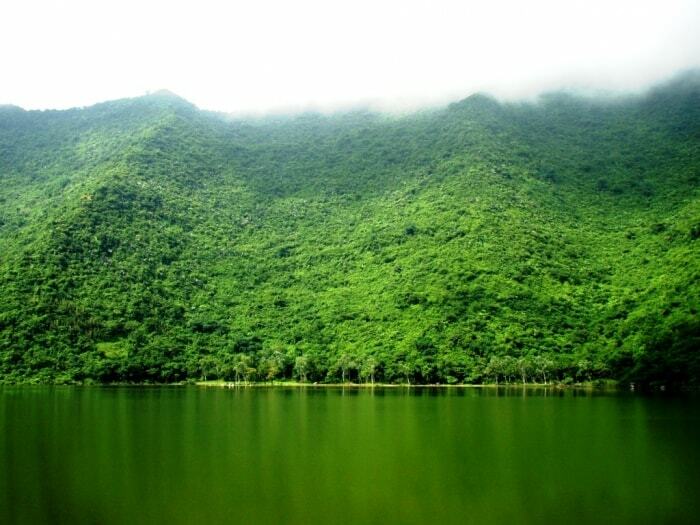 Ho Mac (Mac Lake) located right in the Cuc Phuong National Park, about 1.5 km from the entrance gate, the tranquility of Mac Lake will conquer the most difficile visitors in the sense of natural beauty. You can rent a kayak and sail on your own to discover the scenery, or hold fire camps, ethnic performances, fishing, folk games.. Here’s also available camping tents or bungalows for overnight stay in Cuc Phuong park. It consists of a separate apartment with modern rooms, TV, hot water, air conditioning, beautiful views. Wandering along the lakeside road, you will see many colorful butterflies. Note: Take your binoculars to see many types of birds and beautiful butterflies on your way to discover each interesting part of Cuc Phuong.